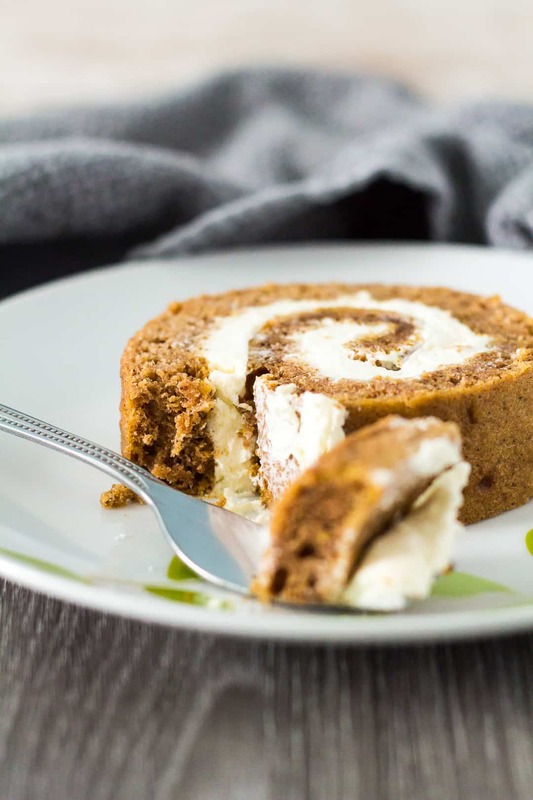 Pumpkin Cake Roll – Deliciously moist and fluffy cake roll that is loaded with pumpkin and warm spices, and is filled with a whipped cream cheese filling. The BEST pumpkin cake roll! 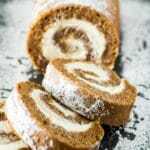 I originally published this pumpkin cake roll recipe back in September 2015, but today I bring you an updated version. I’ve totally revamped the recipe and photos, and I’ve included a video. Large eggs: You’ll need 4, with the yolk and whites separated. Cake flour: See my recipe notes below on how to make your own cake flour! To make this cake roll, whip the egg whites until stiff peaks form, and set aside. Whisk together the egg yolks and sugar until pale and thick, then mix in the vanilla, yogurt, and pumpkin. Add the flour, baking soda, spices, and salt, and mix until combined. Gently fold in the whipped egg whites. Pour the batter into the prepared pan, and spread out evenly. Give the pan a gentle shake to even out the batter. Bake for 10 – 15 minutes or until the cake springs back when lightly touched. Allow the cake to cool for 5 minutes. Invert the cake onto a tea towel dusted generously with icing/powdered sugar. Leaving the parchment paper on, roll the cake up with the tea towel, starting at a short end. Allow to cool completely on a wire rack. For the filling, whip the heavy cream until it starts to thicken. Add the cream cheese, icing sugar, and vanilla and whip to stiff peaks. Unroll the cooled cake, peel off the paper, then spread the whipped cream evenly over the cake. Re-roll without the tea towel, then cover and refrigerate for at least 1 hour. Dust with icing sugar, then slice and serve! perfect for Halloween or Christmas! How long will this cake roll last? Leftover cake can be stored, covered tightly, in the fridge for up to 3 days. Can I freeze this cake roll? Cake roll, with filling, freezes well for up to 2 – 3 months. Thaw overnight in the fridge before slicing and serving. 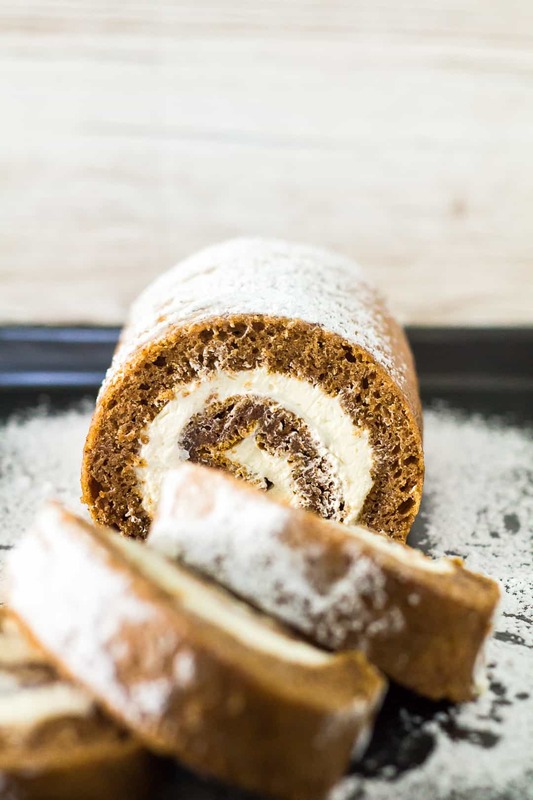 Deliciously moist and fluffy cake roll that is loaded with pumpkin and warm spices, and is filled with a whipped cream cheese filling. 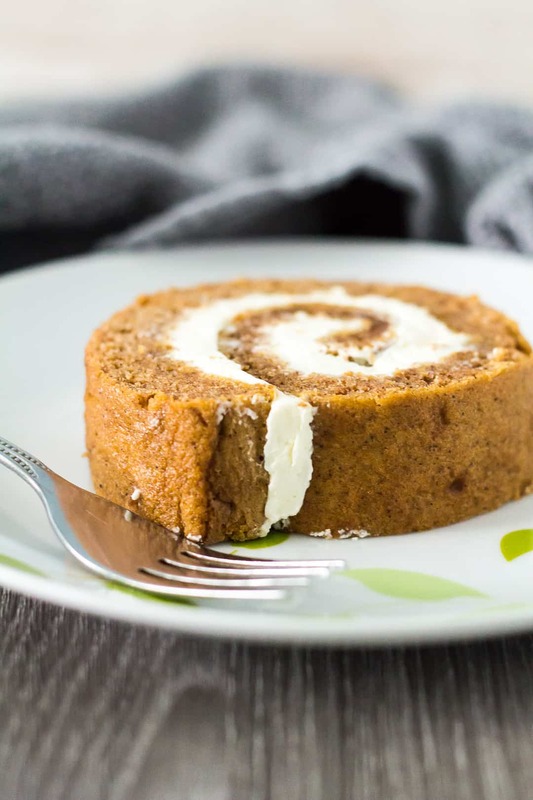 The BEST pumpkin cake roll! In a separate bowl, whisk together the egg yolks and sugar until pale and thick. Mix in the vanilla, yogurt and pumpkin. Add the flour, baking soda, spices, and salt, and mix until combined. Gently fold in the whipped egg whites. Pour the batter into the prepared pan, and spread out evenly. Tap the pan lightly on the surface a few times to level out the batter. Bake for 10 - 15 minutes or until the cake springs back when lightly touched. Cool for 5 minutes. Invert the cake onto a tea towel dusted generously with icing/powdered sugar. Leave the parchment paper on and roll up the cake with the tea towel, starting at a short end. Allow to cool completely on a wire rack. Using a handheld or stand mixer fitted with the whisk attachment, whip the heavy cream until it starts to thicken. Add the cream cheese, icing sugar, and vanilla and whip to stiff peaks. Unroll the cake, peel off the paper, then spread the whipped cream evenly over the cake. Re-roll without the tea towel. Cover and refrigerate for at least 1 hour. Dust with icing sugar and serve. I love roulades! Like you say, they always look impressive and people think you’ve taken forever on them. This one looks positively scrumptious! One thing I really miss about living in the States is pumpkin. I’m British and we don’t really do pumpkin over here. They appear in shops for about a week at Halloween but that’s it. No pumpkin soup, no pumpkin pie….I miss it! Augh. Looking at this makes me so ridiculously jealous of your rolling skills. You don’t even know. One day I’ll ace the ‘perfect roll’. One day. Marsha, this looks amazing! It’s so reassuring to know that they’re not so hard to make. I will definitely try this this fall! Marsha, Marsha, Marsha – you must get that all the time – but I just couldn’t resisr!! I absolutely love pumpkin, this recipe and your blog! I will be makig this for the family – thanks for sharing! You know what’s funny is that I was JUST thinking about how good a pumpkin roll would be! Now you’re making me really hungry! 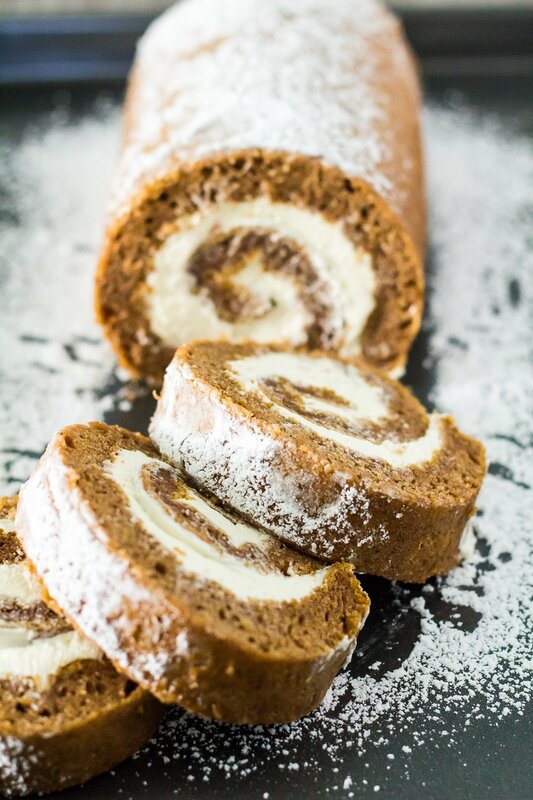 Pumpkin rolls are one of my favorite fall desserts! And like you, my favorite desserts are the ones that look impressive but are a cinch to make! I am in love! Pumpkin roulade must taste heavenly 🙂 Pretty photos, too. This looks great – thanks for letting me share in my pumpkin roundup that goes live tomorrow! This cake roll looks amazing!